While the concept of "working out loud" has been gaining popularity, thanks to the work done by thought-leaders like Jane Bozarth (Show Your Work), John Stepper (Working Out Loud), Austin Kleon (Show Your Work) and such, I still encounter bemused looks when I bring up this topic. I wrote about the strategies and benefits of working out loud earlier here and here. In this post, I want to break down the activities based on the tools/platforms we already have at our disposal, and often access on a daily basis. These tools are free, easy to use and accessible to all as long as we have a device (smartphone, tablet, computer) and an Internet connection. A bit more conscious thinking behind why, when and how we use these platforms can transform our daily meandering interactions into purposeful habits around learning, sharing and community building. This thought was triggered by David Kelly's presentation - Social Media, Social Learning, and Curation where he highlights the role each of the social tools/platform can play in our sharing and learning. Before I get into how each of the tools facilitate and inspire #wol, I want to highlight that the process of working out loud is not only restricted to synchronous sharing of what one is doing at the moment with a closed group or team. Working out loud ranges from specific, objective-driven collaboration (as in the case within project teams) to just sharing of thoughts and ideas with the wider social networks. The former leads to focused learning and the latter leads to serendipitous discoveries. These wider implications are brilliantly captured in the diagram by Harold Jarche below. The different elements of working out loud from sharing with purpose and leading with generosity to building relationships, engaging in visible work and learning are all achieved through thoughtful and generous use of the different tools. I have discussed each platform based on my usage pattern and preference; the order in which they are listed is not a reflection of the tool's inherent quality or characteristics. Twitter: The trigger question, "What's Happening"? that Twitter greets you with is a great initiator to begin "working out loud". Summarizing what you are doing, learning, or being challenged by in 4~5 tweets of 140 characters each can be very useful in sharing it with the outer world and in putting one's work process and learning in perspective. Articulating a dilemma or a question or a learning adds clarity and often brings insight. These kinds of summation comes out of reflection - a key component in the learning cycle. Adding relevant (#) hashtags make the tweets easy to find later. In effect, it can act as a set of notes of one's day's learning aggregated and filtered via hashtags and shared with the broader world. Any response to the tweets brings additional insights and new perception. The additional advantage is the ability to @mention individuals and thus share with definite folks or direct questions at specific individuals. Working out loud on Twitter therefore has dual advantage of collaboration & cooperation as well as the ability to seek direct help. Small working out loud circles can use Twitter effectively through facilitated tweet chats as well. It may require a facilitator to add cohesion and keep the live conversation on track. When is it most useful to use Twitter? Sharing and #wol on Twitter is most useful when one is engaged in the activity -- it can be a project, a subject/skill/topic one is trying to master, a client challenge or any other activity. Sharing on Twitter encourages synthesizing the work in micro-chunks, reflection and collaboration. Because of it's byte sized updates, Twitter encourages live conversations and exchanges -- a hugely advantageous aspect of #wol. LinkedIn: It's a professional networking platform that offers various collaboration and sharing features like "Share an Update", "Upload a Photo" or "Publish a Post". While it's not a platform where one may be comfortable sharing updates regarding semi-complete work-in-progress projects or the day's challenge, it still offers possibilities of reaching out to a wide network of experts and professionals across different domains. LinkedIn's Group feature offers interesting #wol possibilities since these can be kept Open or Private as per the group's objectives. Creating private groups can help to eliminate inhibitions around sharing and create a safe environment. A group facilitator can channel discussions and encourage participation. Since LinkedIn is a professional network, trolling is likely to be controlled. The "Publish a Post" feature encourages thoughtful sharing around one's area(s) of expertise and passion. Since it's primarily a professional network, this also builds credibility, enhances your brand, and becomes a one point of reference to showcase skills and experience. Other professionals in the same field stand to gain from your sharing and you can come to be perceived as a thought-leader in the space. When is it most useful to use LinkedIn? LinkedIn is most useful when #wol has been given some time to crystallize such that the sharing is more cohesive and holistic. It might encompass the entire process one followed when managing client expectation or the approach one took to learn about sketch-noting and implement the learning. Abhijit Bhaduri's post, Want To Improve Listening Skills? Try Sketchnotes is a great example of the latter. After reading the post, I have a better sense of how to approach sketchnoting, a skill I've been trying to pick up for some time. Facebook: While the platform gained traction as a social networking site where individuals find and stay in touch with lost friends and far-flung family members, I see it increasingly being used as a learning and sharing platform by various groups including passionate photographers, wildlife lovers, travellers, artists and such. Facebook invites its users to "Update Status", "Add a Photo/Video" or "Create an Album". Any or all of these features can be used to share what you are doing, seek other's help or just be a good community member and share one's learning. Facebook Groups are large communities where people are already working out loud in their varied areas of interests and sharing tips ranging from which lens to use when doing macro photography to where one might buy/hire such a lens. 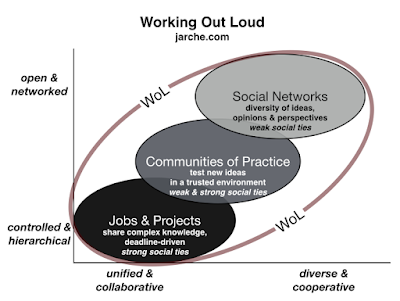 The group features encourage #wol in various ways as highlighted in the image below. 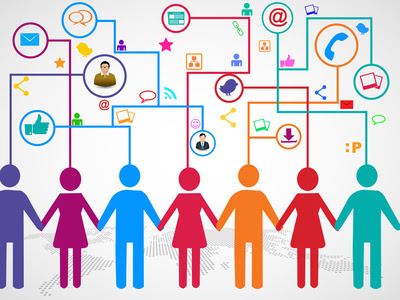 The ease with which a group can be set up and content shared and discussed is a key to attracting users. 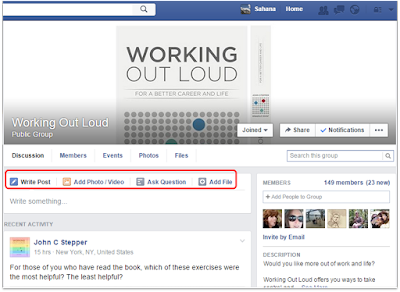 As is evident, this #wol group set up by John Stepper is not only encouraging everyone to discuss what they think but is also helping to build a community around the concept and build it into a practice. It is therefore quite easy to see how #wol can have far-reaching impact beyond just sharing what one is doing at the moment - it enables skills like reflection, articulation of ideas, building of a personal learning network (PLN), managing one's learning (PKM), and connecting with similarly passionate people across the globe and thus build a learning community of cognitively diverse individuals. When is it most useful to use Facebook? This is a platform that is perhaps most often used by the majority. 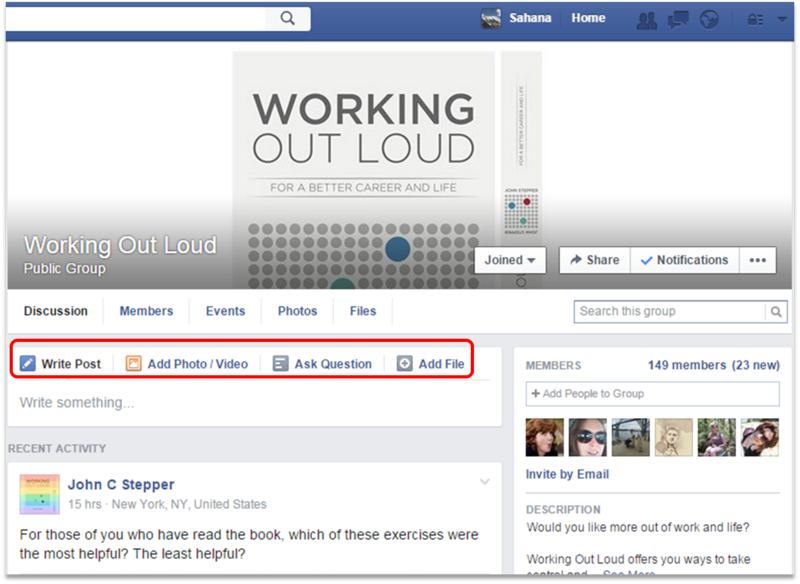 Because it allows easy uploading of videos, images and text updates, Facebook can be used for any kind of #wol. For team level sharing, there can be private groups. For broader community building, one can have open groups. It is easy to add other interested individuals to the groups and thus build a community gradually. SlideShare: Presentations are a great medium for visually capturing complex thoughts and ideas. Synthesizing abstract concepts or showing a process via a presentation and posting it on SlideShare can be a very powerful means of sharing. Designing a presentation calls for multiple skills: visual representation, content design, pattern making and story telling. These skills are advanced meta learning skills that require consistent practice and effort. Crafting a presentation to share on SlideShare once a month or so can be an effective #wol habit that not only communicates your ideas to a wider audience but enhances your processing and meta-cognitive skills. I have tried to combine a couple of blog posts into these presentations: L&D Re-imagines - 21st Century Workplace Learning and Community Management - Towards a Learning Organization. When is it most useful to use SlideShare? It is most useful when you want to capture your ideas in a cohesive flow and make it easy to assimilate at a glance. While it is possible to add comments to presentations on SlideShare, it is not a platform for conversation. It is more suited for sharing of well-thought out ideas in an engaging format. Since SlideShare users can Like, Share and download the presentations, it is best to make each presentation complete in itself. Thus, in contrast to the fast-paced, real time, informal sharing on Twitter, SlideShare requires a more thorough output. Pinterest: This can be a unique #wol space which uses the visual medium in powerful ways. Pinterest allows one to create Boards around topics. Within each topic, a user can collate images as Pins which can be shared with a broader network. You can also pin images from other people's boards to your boards, thus creating a rich network of images created/curated around specific topics. I find various boards on topics as disparate as social business to visual thinking very useful. Boards by Sunni Brown or Abhijit Bhaduri on sketchnoting and visual thinking are great learning tools for me. While on immediate thought Pinterest may not seem like a #wol tool, it can be used very effectively as one. It is primarily a curation and aggregation tool that lets you curate images/photogrpahs, infographic, diagrams and models around a topic. It is easy to share the link to your boards or specific pins. Here are the links to a couple of my boards: Future of Work and Content Curation. When is it most useful to use Pinterest? When you have a collection of images (either created or curated) that can be grouped into topics, Pinterest comes in handy. Here is a Pinterest board on using Pinterest effectively. Finally, for those keen to begin working out loud, here is a You Tube video by Helen Blunden (@ActivateLearn) called Have I been Working Out Loud? that provides a practitioners' take on the topic.